Diamonds… one of Mother Nature’s dazzling nuggets. Treasured since ancient times, there is nothing that captures light and brilliance more than a well cut, natural diamond. The most beautiful diamonds are thought of as luxury items, well outside of most people’s reach. But is this really true? 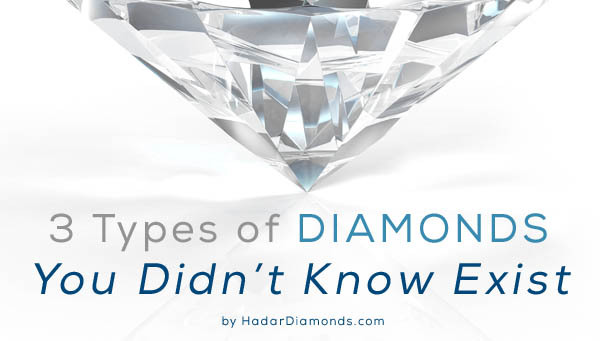 Hadar Diamonds proves this is a myth. With advancements in technology, there are certain natural diamonds that can undergo processes to improve color or the appearance of clarity. So why would you want to learn more about these types? The answer is simple. To save money while still knowing that you own a natural, beautiful diamond that can be treasured for a life-time, at an affordable price. There are 3 types of diamonds that have come on to the market and have proven the test of time: GIA Certified Natural HPHT Diamonds, Laser Drilled Diamonds, and Clarity Enhanced Diamonds. In today’s review, we will go over the characteristics that make them ideal choices for couples getting engaged and investors alike. They are in order of price per carat value from high to low. Not to be confused with synthetic, lab-grown diamonds, GIA certified natural HPHT diamonds are show-stoppers that are increasingly sought-after by sophisticated diamond buyers and investors. Natural HPHT diamonds are desirable for their remarkable beauty and permanence. It is rare to see an HPHT stone with less than VVS2 clarity or F color. The clarity is intrinsic, coming out of the earth with extremely high clarities and superior molecular structure. So superior, these types of diamonds (Type IIa) are strong enough to withstand a process that mimics being put back in the earth’s immense heat and pressure to change their champagne or light brown color. There is nothing taken away from or added to an HPHT diamond. The reason GIA certified natural HPHT diamonds are so desirable is because of their great beauty and characteristics indistinguishable from a diamond that originated as colorless. Only sophisticated instruments can detect whether or not these diamonds have been processed. Question: Hello, I’m curious about HPHT diamonds – are these considered natural diamonds or synthetics? GIA response: HPHT stands for high pressure high temperature. HPHT is a process to grow synthetic diamonds and it is also a process to alter the color of natural diamonds. If it is a HPHT synthetic diamond, the diamond will receive a synthetic diamond grading report: http://www.gia.edu/gem-lab-service/synthetic-diamond. For any synthetic diamond submitted to our lab, if it has not been laser inscribed with the phrase Laboratory Grown, we will inscribe it ourselves before returning it to the client. 2) The registered trademark that is exclusive to diamonds that have undergone the HPHT process. If the diamond was submitted with the registered trademark already inscribed, we will not add HPHT PROCESSED to the girdle. For a diamond in the D-to-Z range, under comments it will note the laser inscription and the following: “The diamond has been processed by high pressure high temperature (HPHT) to change its color. If the diamond is a colored diamond, in the color section of the report, under Origin, the color will be listed HPHT Annealed. In the Comments section, it will have the statement from above. It is considered stable so that is why we will issue grading reports on these diamonds. The key take-away points here are a) GIA certified natural HPHT diamonds receive a natural diamond grading report (versus a synthetic diamond grading report) and b) Natural HPHT diamonds are considered stable, that is why the GIA issues grading report on these types. What is a laser drilled diamond? Laser Drilled (LD) stones are those that have had dark inclusions removed with a microscopic laser to improve the appearance of clarity. The thin laser (smaller than the diameter of a hair) strategically targets the black carbon spot often from the bottom of the diamond. The channel the laser creates is then used to “wash out” the inclusion with a solution. A common question with laser drilled diamonds is “Can the channel the laser created open a space for dirt to get in to the diamond?” The answer is no, the channel is so small, particles cannot enter the stone. Another question is “How much can laser drilling improve the clarity of an included stone?” Typically, the clarity can be improved by one grade. So, for example, if you have an SI2 diamond, it can be improved to an SI1, or in rare cases, even a VS2. What does this mean for you? It means that you can pay for a lower clarity diamond, while having the permanent appearance of a grade or two more. All, while still knowing you are wearing a natural diamond that requires no special care. Laser drilling is considered to be a permanent process, and the clarity will remain the same forever. Clarity enhancement remains to be the most often misunderstood processes of all diamonds. Especially with all of the misleading articles on the internet and fierce competition in the diamond market, the information on clarity enhanced (CE) diamonds can be overwhelming. While it is true that clarity enhanced stones with deep enhancements are not suitable for purchase in our opinion, clarity enhanced diamonds when processed correctly are an excellent alternative if you are looking for a larger diamond at an affordable price. Deep enhancements can be easily detected under magnification by seeing a strong red line. These red lines indicate unstable stones that are prone to breakage. Another indicator of a potentially sub-par stone is price. While clarity enhanced diamonds by nature are priced lower than their non-enhanced counterparts, it is important to understand what “sounds too good to be true.” It is also important to note that in the past few years demand for CE has increased, and the market continues to realize higher prices for these types. When done well by enhancement experts, clarity enhancement is a reliable and proven method to beautify a diamond that may have had a “whoopsie” when cut. Diamond cutters are human and can make very expensive errors while cutting a stone. The cutting wheel moves very fast and is slippery, and naturally, every once in a while the cutter will slip and create a superficial, tiny scratch on the surface of the diamond. While it’s no picnic for the cutter to admit it happens and suffer the financial loss of an error like this, it does occur. However, what you didn’t know, is that it can work to your benefit to afford a bigger diamond for less. After the scratch, commonly known as a “feather,” is analyzed, the cutter will decide if it is fit for enhancement. (By the way, not all are). From here, the diamond is taken to enhancement experts to improve the clarity of the stone by means of filling the feather with a diamond-like substance. This can essentially restore a diamond back to its original clarity appearance prior to the whoopsie the cutter may have inadvertently made. What does a clarity enhanced diamond look like or learn more about the process? Review the videos below of a few beauties. Now that you are familiar with 3 types of diamonds you didn’t know exist, you also understand that yes, you CAN afford a natural, stunning diamond that will last forever. Hadar Diamonds prides themselves on a pressure-free environment that focuses on providing consumers with education and one-on-one consultations to ensure diamond buyers worldwide have confidence in their special purchase. For more information, contact Hadar Diamonds at 619-572-8100 or visit www.HadarDiamonds.com . We look forward to your visit!